Nuno Cavaco is a former rider at the prestigious Portuguese School of Equestrian Art (EPAE). Become a more sensitive rider and gain a lighter more responsive horse. Nuno – “Often I am asked how to develop more sensitivity when riding, this is always difficult to explain as sensitivity is a very personal thing. However I believe that learning to work horses in hand will really help every rider to become much more self aware and sensitive. 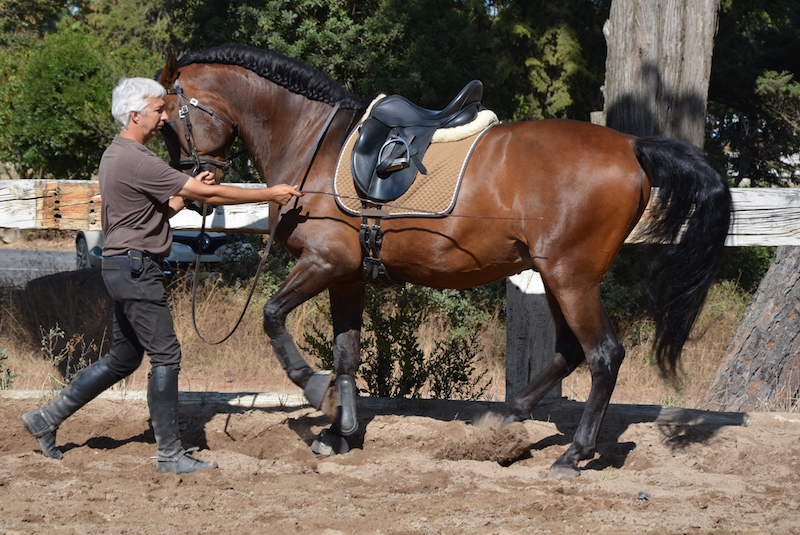 The reason is when working from ground you have to lighten everything you do, it enables you to be able to clearly observe your horse´s response to the rein contact, understand his conformation better and the reactions through his body. It also helps your horse to become more sensitive, quicker and lighter to the aids”. Important Note – When working in hand It is important that all the exercises are progressive. You are aiming to achieve lightness and self carriage. The over using of the whip and forcing the horse will create stress and possible injury leading resistance to the exercises. Be mindful of your actions at all times. With all this work it is advised that if you are beginning that you find an experienced trainer in your area or come to Portugal and train with Nuno to learn the movements and techniques. In this section we are looking at travers, half pass and rein back. Helps a horse to learn to performs exercises calmly before ridden. Definition – this is a side movement on three or four tracks. The horse´s shoulders follow the track along the circle or the wall and the hindquarter is on the inside track. In this exercise, the horse´s body is curved laterally from neck to tail. The outside hind leg is stepping under the weight therefore it carries more weigh and this in turn lightens the inside shoulder. Nuno generally begins with quarters in on the circle to prepare for the traver so your horse is making a circle with you on outside of the circle. It is important that your horse maintains an inside bend. When the horse is in a calm walk then Nuno gently taps the hind quarters asking him to move them off the line to the inside track. Maintain the position in walk and ensuring your horse stays in balance and rhythm. Remember to pat and reward him when he achieves even just one step correctly. 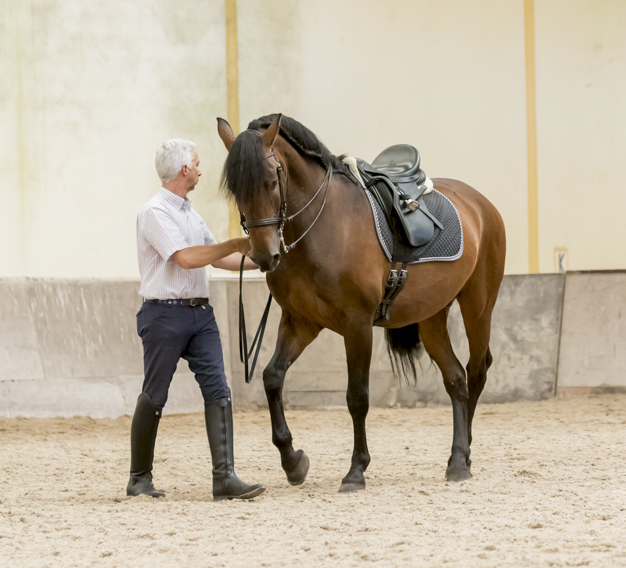 Don´t been tempted to lean into the horse or push him into position your aids must be light and dynamic as the horse carries out the exercise with self carriage. Once you have achieved this on a circle on both reins you can move to the outside of the arena to perform the traver position yourself one metre in from the wall or fence (for your safety don´t put yourself in a position where you are right up against the wall) Now in the same way as before ask your horse to walk forward with an inside bend and then ask him to move his hind quarters to inside track. Practice taking the 1/4, central and 3/4 lines. 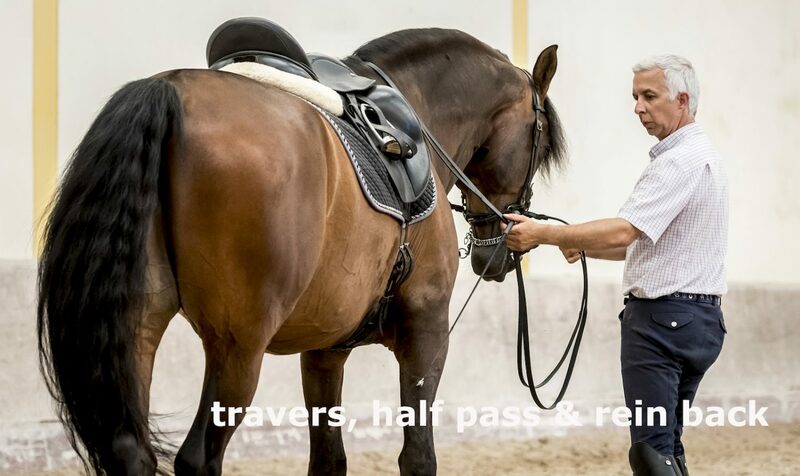 To perform travers and half pass Nuno tells us you need to be working on the outside of the horse you can walk either facing the horse´s shoulder or backwards. 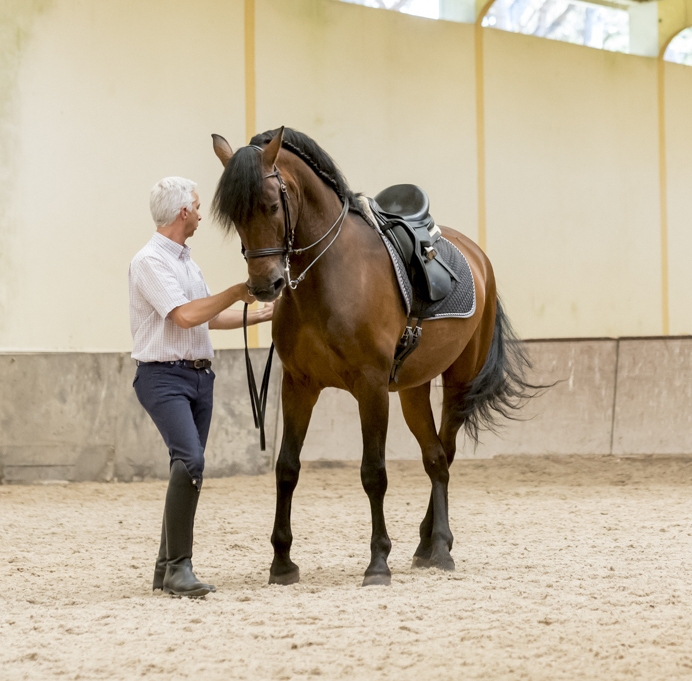 This exercise greatly improves the mobility and engagement of the hindquarters. The Half Pass is when the horse moves diagonally in a lateral bend, in a forward-sideways mode, he looks in the direction he is going. During the half-pass, the horse steps under with its inside and outside hind legs alternated. The outside leg step in front and across the inside leg. It is by far the best to teach horses half pass in hand before riding it. The half pass can be taught from quarters in, tracer or from the shoulder in. It is important that your horse understands both shoulder in and tracer before beginning half pass. It is most dynamic to use both methods and coming from the circle or on the outside wall using the 1/4, central and 3/4 lines. In the half-pass you want to go forward and sideways to develop the hind legs, both hind legs need to connect with the centre of mass. Therefore the shoulders should always lead, meaning they are always in front of the hindquarter. (If the shoulders don’t lead the hind legs will step next to the centre of mass, which means they won’t take weight). Half pass from traver on the outside of arena. Come along the long side in traver as you turn into short side move onto the quarter line where you can ask a very gradual half pass just 3 paces to begin with then relax you are aiming to reach the other end of the arena when you finish but it´s vital you achieve a gradual build up to this. The reason to begin on the quarter line is because the angle is much softer for your horse you are looking to keep him relaxed and stress free. As your horse progresses, becomes stronger and more flexible you can increase the exercise. Once again ensure that you perform this exercise calmly and lightly. Zagal is more advanced in half pass so he is more able to cross over further beneath his body and his bend is greater through his body. Nuno considers this one of the most important exercises you can do. It is highly gymnastic and dynamic. The rein back is a vitally useful gymnastic exercise with so many benefits making it invaluable in all areas of training especially for obedience and engagement. Practising a good quality rein back enables your horse to round his back and release through the pelvis. It is important to teach rein-back with the horse in the long-and-low position. This frame stretches the top line, encourages the back to rise and the pelvis to flex. It teaches the horse to shift his weigh backwards. 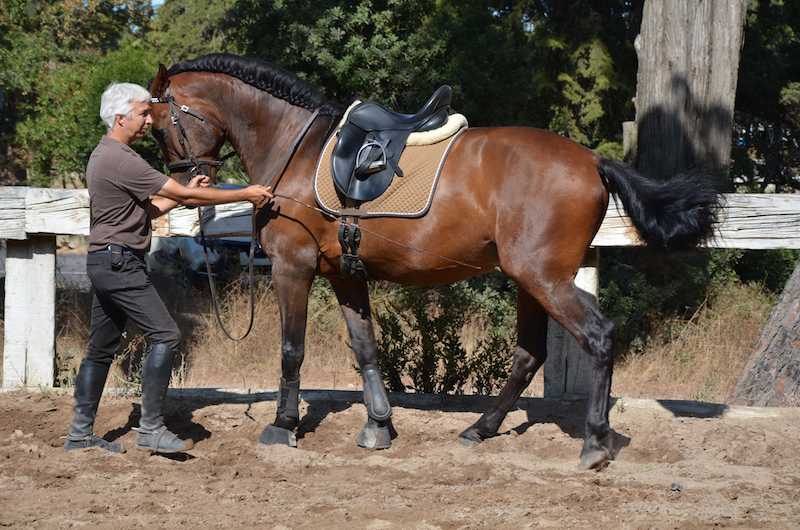 Nuno tells us that riders don´t practise this exercise enough either ridden or in hand. 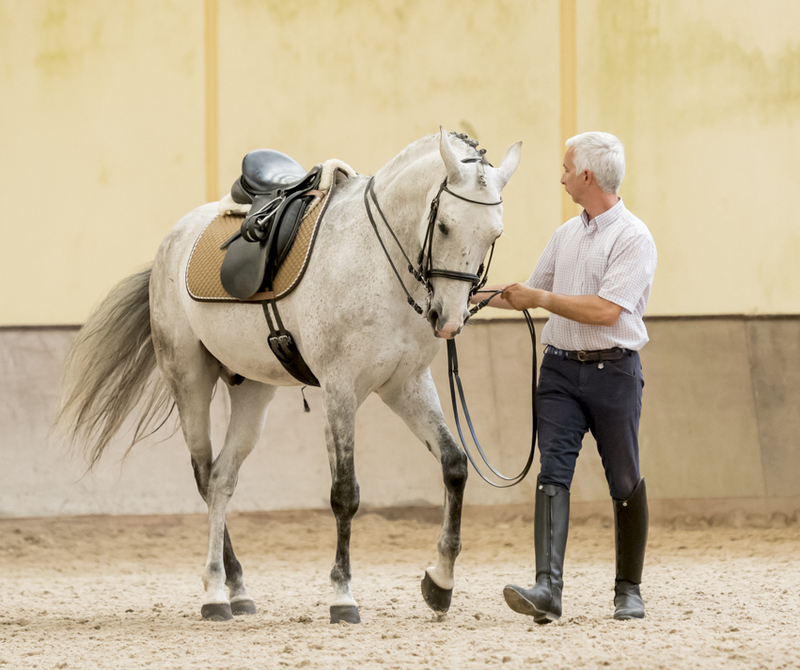 However he also emphasises that the rein back performed badly can be damaging both physically and mentally, therefore it is vital to fully understand how the exercise should look and be performed. The classical masters such as Mestre Nuno Oliveira used this exercise frequently. How to teach rein back – you begin on the long side of the arena next to the wall. Halt your horse ensuring you have a square halt hind legs well under him. The horse must be with his head low and forward. Standing to the inside of the horse beside his shoulder you invite him to take one step backwards using your hand with a very gentle pull on the reins keeping his head low. You may need to use the whip lightly at the position where your foot would be the first few times or in front of his chest but eventually you will need to wean him off the whip. Then you only use your whip to keep him straight if needed by placing it where your leg would go to hold him straight. First do just one step, reward, drop reins and immediately move forward then halt again square and ask one step and reward move forward. The idea is to build up to four well placed steps backwards remaining straight – the shoulders must be in line with the haunches and your horse very relaxed. 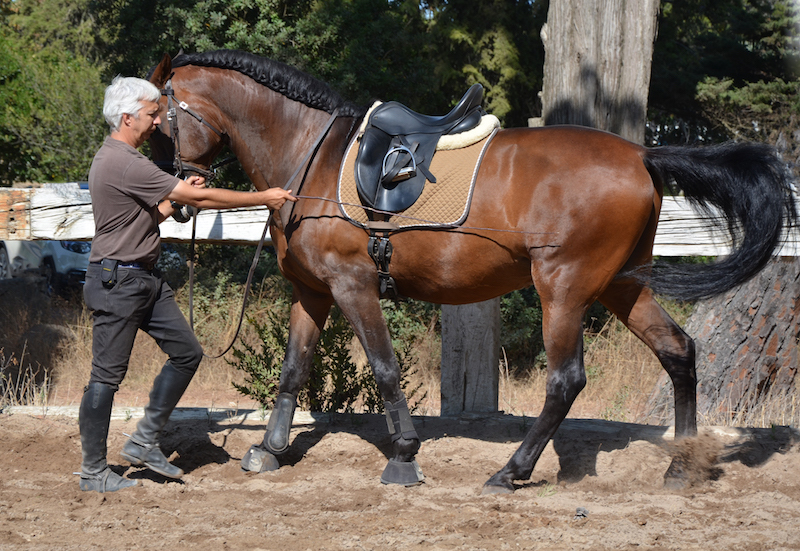 If your horse isn´t straight correct immediately or more forward and begin again from the start. Practice this on both reins. 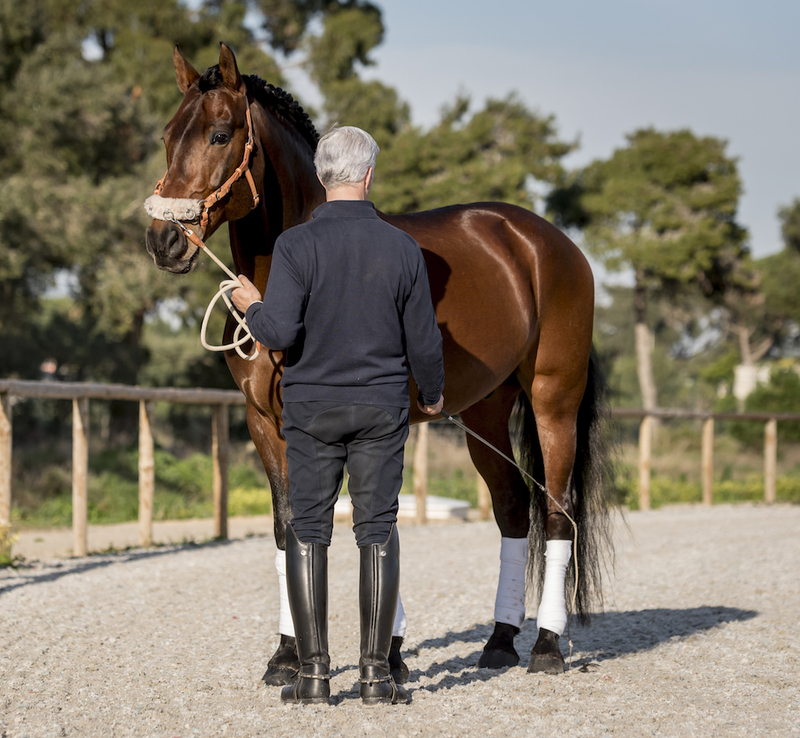 The mechanics of the exercise – Once the horse understands the aids and begins to take more than one step backward, you must to begin to focus on his hoof placing. It is important that the rhythm is good and regular to maintain the rounded back and balance. You are looking to develop good rhythm, relaxed movement with dynamic well placed steps. Always reward with a pat and move forward. 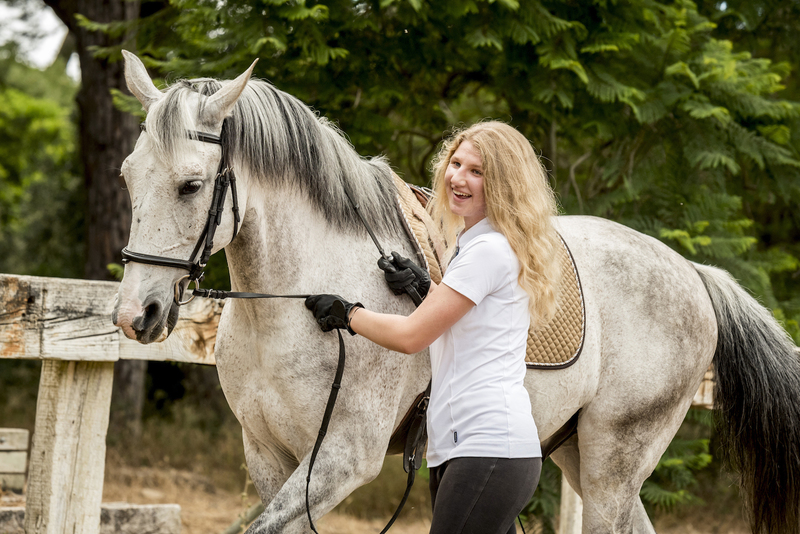 Testimonial by Emma 16 year rider – She joined us in Portugal to ride Classical Dressage and learn about working in hand for the first time. I really enjoyed the In Hand work it was so interesting. Working from the ground at close quarters to the horse I found I really saw and experienced the reaction from the horse to my every move, even the slightest movement of the reins. Also how they reacted to the touch of the whip in different places. It has really made me aware of how careful and precise you have to be when using your aids to achieve the correct response from the horse. This is directly related to my riding. Thank you for a great week! I have had the pleasure to have lessons with Nuno whilst on a riding holiday at Quinta Do Rol in Portugal and watch Nuno do in hand work in the UK. My confidence and ability as a rider improved a lot thanks to Nuno’s teaching. Nuno is both very calm and patient and at the same time very precise and consistent. Each day we built a little more on what we had worked on the day before. I learned a lot, in particular the importance of good preparation to any exercise and above all, work with the horse so that the work is a pleasure for both the rider and the horse. That means understand them, their individual personality, how nervous they are or not, their weakness, strengths etc and adapt the “conversation” with the horse accordingly. 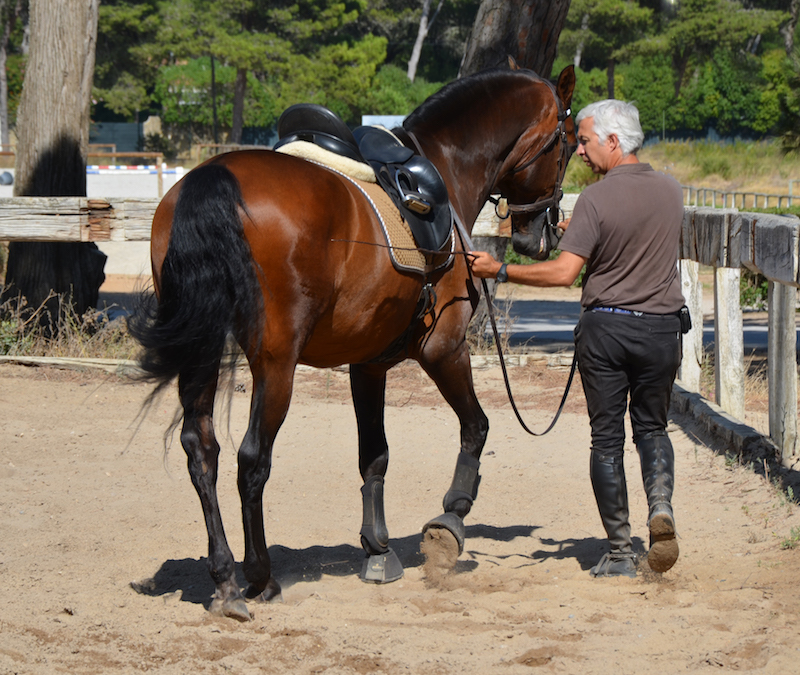 Thanks to Nuno I am able to be more confident with my own horse and communicate better with him so that we are more relaxed, effective and harmonious together.